Evil organizations are all the craze these days on the silver screen, taking center stage in at least four 2015 Major Blockbusters: Avengers: Age of Ultron, Mission: Impossible – Rogue Nation, SPECTRE (ha), and the forthcoming Star Wars: The Force Awakens. Nothing like a whole industry of villains and evil doers, often, but not always, operating in the shadows. And though several of the “organizations” chosen are literally companies, they also fit the mold of “Nefarious Organizations.” Not just any company will do, but these certainly more than your simple morally corrupt businesses. I’ve gone ahead and ranked them, most effective to least. Let’s start with #8 through #5! Voldemort takes a cue or two from S.P.E.C.T.R.E., but instead of rings they all got matching tattoos! I’m not even a Harry Potter fan (I’ve read 6 and 1/2 of the books, but never made it far enough in the film franchise to see said organization), but my roommate tells me I should look past my own interests, and the Death Eaters were the 1st Evil Organization I could think of outside my traditional Geek World (which would be mostly Marvel Comic Book Evil Organizations…). 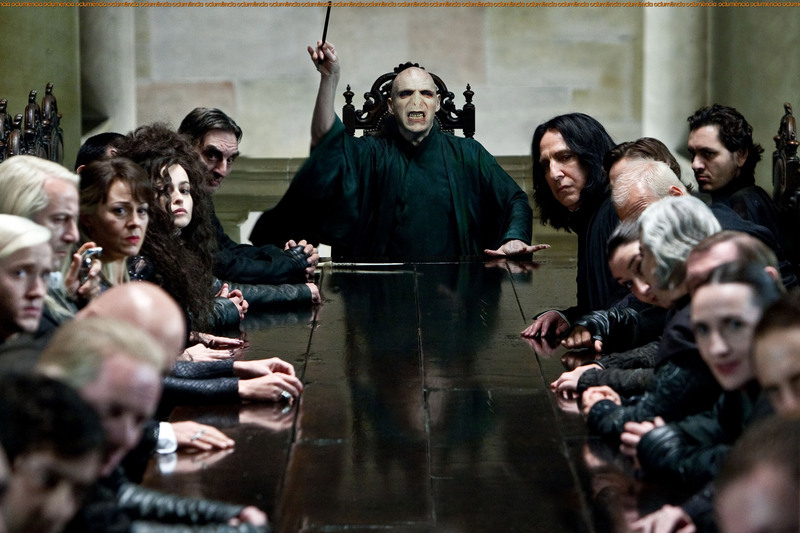 Death Eaters definitely qualify as a Nefarious Organization, one that, like the best of them (that follow), have members at every level of government, Hogwarts, and even that weird Magical Bank with the trolls. Not a lot is scarier than a group of zealots awaiting and/or aiding the return of their evil leader: He who must not be named! In Sam Raimi’s original films, Oscorp was simply the company that Norman Osborn (Willem Dafoe) would experiment on himself… and kill… to remain in control and keep profitable. In Marc Webb’s Amazing Spider-Man films, the corporation is responsible for a man-lizard, an electricity man, a mutated head of the company, and a series of enhanced soldier suits based on animals including a rhinoceros, a vulture, and an octopus. A little hokey, sure, but it actually makes more sense than the original 2002 Spider-Man. Think about the major superhero villains these days. Tony Stark’s genius leads to Iron Monger, Whiplash, Extemis, and Ultron. The Super Soldier serum administered by the same scientist creates both Red Skull and Captain America. Batman’s appearance brings the Joker into the world as a direct response to his theatrical vigilantism. But in Spider-Man, it’s simply a hard to believe coincidence (even if you’ve bought into a man who can stick to walls and swing from webs) that Peter Parker (Tobey Maguire) was bitten by a radioactive spider the very same night that Norman Osborn accidentally turns himself into a crazy super soldier to save his company. Ridiculous! Mending this storytelling shortfall, Oscorp is behind all the foes Andrew Garfield’s Peter Parker faces, whether that be an overreaction or not. Certainly qualifying the company that Norman Osborn built a spot on this list! InGen didn’t seem like such a bad company when John Hammond was around. But since he hit his death bed, other forces within the corporation have put profits above human safety… and worse. It starts with Hammond’s nephew in The Lost World: Jurassic Park, who will stop at nothing to grab dinosaurs out of their new “natural” habitat on Isla Sorna, a.k.a. “Site B” and present them to the masses. Even when the star exhibit, a full grown T-Rex, wrecks havoc in San Diego. Even worse, Dr. Henry Wu (B.D. 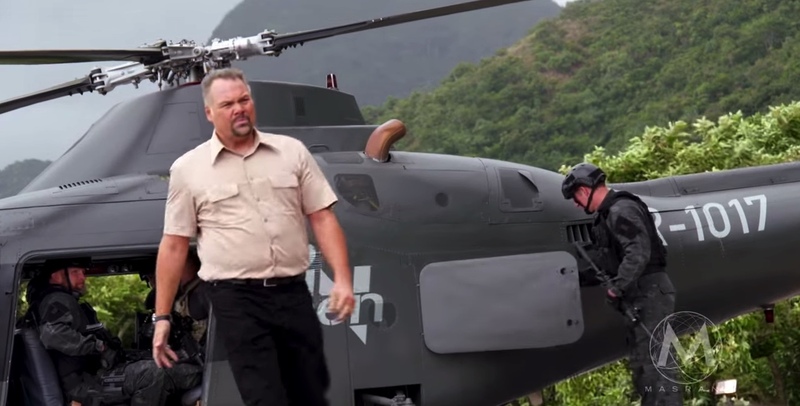 Wong) and Hoskins (Vincent D’Onofiro) clearly have a real shady deal going on behind the scenes of the theme park, Jurassic World. Hoskin’s obsession with military applications for carnivores and Dr. Wu’s gene-splicing skills offer even more trouble than in the 1st Jurassic World film, paving the way for a trilogy of InGen’s evil doings! No matching tattoos here, but of course Agents of S.P.E.C.T.R.E. have matching jewelry! S.P.E.C.T.R.E. has been on the big screen longer than any other Nefarious Organization on this list, originating in Sean Connery’s days only to be revived this year in Daniel Craig’s world. S.P.E.C.T.R.E. stands for Special Executive for Counter-Intelligence, Terrorism, Revenge, and Extortion (like with do-gooder organization S.H.I.E.L.D., someone just really wanted to spell SPECTRE, albeit incorrectly). Now, if you read my review for SPECTRE, you know the film was lacking… a lot. In fact, S.P.E.C.T.R.E., the supposed ultimate Nefarious Organization of all time, doesn’t get its due in the 2015 007 film. While Daniel Craig’s 007 movies have improved on every aspect of the character from Casino Royale through Skyfall, S.P.E.C.T.R.E. does not live up to the organization Connery built (well, fought) back in the 60’s. Perhaps if the film SPECTRE was better, this ultimate Evil Organization would have landed on the better half of the list. After all, it is the original shadow group with tentacles in every countries government on all ends of the globe, controlling resources, governments, and intelligence rather than always seeking to start WWIII like later Bond villains. And that’s a wrap! For now… Check back later when I reveal The Top 4 Nefarious Organizations in Cinema, including H.Y.D.R.A. and The First Order, formally the Galactic Empire! Previous A Modern Guide To Movie Going (Holiday Season 2015 & Beyond)! Next BATMAN V SUPERMAN “Gotham” TV Spot Raises Questions: Where’d That Eye Makeup Go?